There's no questioning your safety when you load your pistol with 9mm Personal Defense ammunition by Federal. 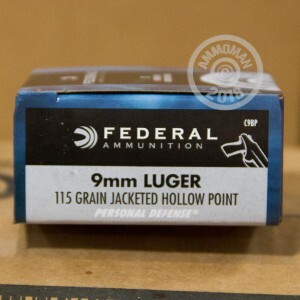 For years, Federal has been providing high quality, reliable defense ammo to carry permit holders everywhere. These 20 rounds of 9mm Luger ammunition will be delivered to you in brand new condition. The 115 grain Jacketed Hollow Point bullet in each load is designed for maximum expansion once it encounters soft tissue, making it the best option for personal defense. JHP bullets also function well in both revolvers and semi-automatics. Each Boxer-primed, brass cased cartridge features a specially designed jacket, allowing it to feed smoothly into your autoloading firearm. The cartridges are also reloadable. 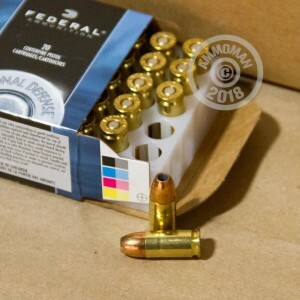 Federal Ammunition Company, founded in 1922, manufactures shotshell, centerfire, and rimfire ammunition at its headquarters in Anoka, Minnesota. 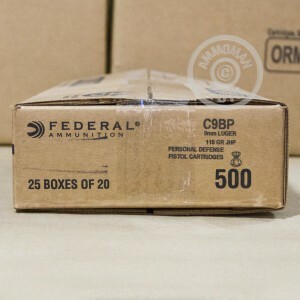 With modern technology and rigorous standards for measuring the quality of their products, Federal remains one of the largest names in the ammunition industry.